Normally, special heart cells generate an electrical signal that travels through the heart. The electricity causes the heart muscle to contract, and that’s what makes a heartbeat. An arrhythmia means the heart is not beating in the proper rhythm. This can cause anything from minor symptoms all the way to cardiac arrest and death. Since different rhythm disturbances need different treatments, diagnosing the precise type of arrhythmia is important. Advanced treatments include medication, destruction of cells that produce unusual signals and devices inserted into the body to generate proper heart rhythms. An arrhythmia is an abnormality in the timing or pattern of the heartbeat. When you have an arrhythmia, your heart may beat too quickly or too slowly, or you may experience an irregular rhythm in which your heart feels as if it is "skipping a beat." Some types of arrhythmia may not be serious. Other types may be of great concern because they can cause fainting, heart failure or even sudden death. If you think you have an arrhythmia, consult your doctor. How does a normal heart rhythm work? The heart is a four-chambered muscle that pumps blood, which carries oxygen and nutrients, throughout the body. The two upper chambers of the heart, the right and left atria (plural of atrium), receive and collect the blood. The lower chambers, the right and left ventricles, pump the blood to other parts of the body. The right atrium receives oxygen-depleted blood from the body and pushes it to the right ventricle. The right ventricle pumps blood through the pulmonary artery to the lungs, where it picks up oxygen. In the same beat, the left atrium receives oxygen-rich blood from the lungs and pushes it to the left ventricle. The left ventricle pumps it through a large artery, called the aorta, to the rest of the body. The heart uses muscle contractions to pump blood through the body. A small burst of electricity causes the muscle to contract. In normal heart function, an electrical impulse starts in the upper right chamber of the heart in the sinus node (sinoatrial node), often thought of as the heart’s natural pacemaker. The sinus node is a group of specialized cells capable of generating a momentary electrical current. The current spreads through the atria (upper chambers), causing them to contract and squeeze blood into the ventricles (lower chambers). 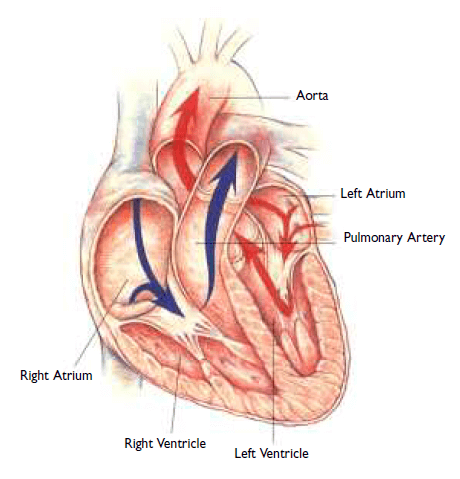 The electrical signal then travels to the atrioventricular (AV) node, located between the atria and the ventricles. The AV node delays the signal for a fraction of a second. This delay allows the ventricles time to fill completely with blood. Once the ventricles are filled, the electrical impulse travels rapidly through the bundle of His, a network of specialized fibers. The bundle of His splits into the right and left bundle branches, which conduct the electrical impulse into the right and left ventricles. With that burst of electricity, the ventricles contract and pump blood out to the body. Normally, the heart’s electrical system triggers the resting heart to beat in this precise sequence 60 to 100 times each minute. This is referred to as normal sinus rhythm. With exercise, the heart rate will increase to above 100 times per minute. A person’s peak heart rate can be calculated by subtracting their age from 220. For example, the peak heart rate for a 40 year old is 220 − 40 = 180. Sometimes arrhythmias are silent, meaning they cause no obvious symptoms. A doctor can detect an irregular heartbeat during a physical exam by taking your pulse, listening to your heart or by performing diagnostic tests. 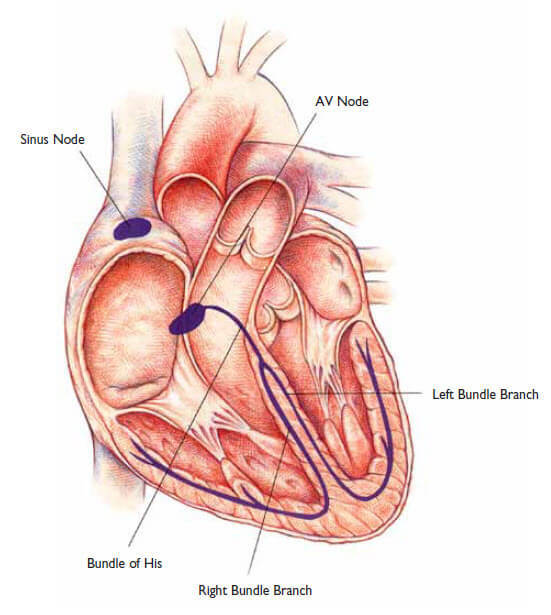 Congenital abnormality of the heart’s electrical system: For example, some patients are born with an abnormal muscle fiber connecting the upper and lower chambers of the heart. The presence of this extra fiber can lead to paroxysmal supraventricular tachycardia (PSVT) later in life. Inherited heart disease that causes abnormalities over time, setting the stage for an arrhythmia. One example is arrhythmogenic right ventricular dysplasia (ARVD): Patients with this inherited condition are born with normal hearts. But over time the heart muscle is replaced by fat and scar tissue, which can cause arrhythmias. Acquired conditions: A heart attack, for example, can cause part of the heart muscle to turn to scar. Scar tissue may be the site of a "short circuit" and set the stage for ventricular tachycardia. Changes over time: The heart may change as years pass, eventually developing an arrhythmia. The best example is atrial fibrillation, which is rare before age 50 but increases dramatically afterward. By the age of 80, one person in 10 has atrial fibrillation. Treatment decisions are based on a thorough analysis of your condition, medical history, lifestyle and other factors. Click each treatment to learn more.